Set a 2-quart pot over medium-high heat. Add milk, water, salt, oats, and brown sugar. Allow the pot to boil uncovered, stirring occasionally. Add the peanut butter, one scoop at a time. Stir until peanut butter is evenly distributed. Continue cooking until thickened. 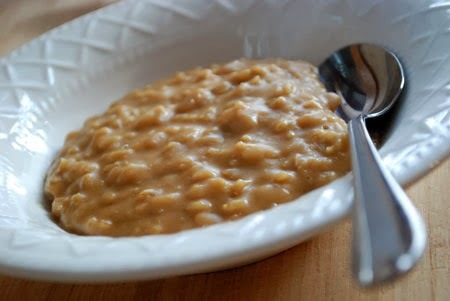 Taste the oatmeal to make sure the grains are tender. Serve the finished oatmeal immediately with optional fruit and slices of buttered toast. Enjoy.